Do you want to start your day with full delight and joy? Then in morning you should keep your attitude positive. Because a good start of the day makes a day joyful. One of the things to keep positive attitude is, reading inspiring quotes or stories. You can also read some jokes or funny stuff. But you must also share this funny or inspiring stuff with your fellows or relatives. And social media helps to share this stuff. There are number of apps available in playstore like FaceBook, Instagram, Twitter, WhatsApp, Pinterest etc. 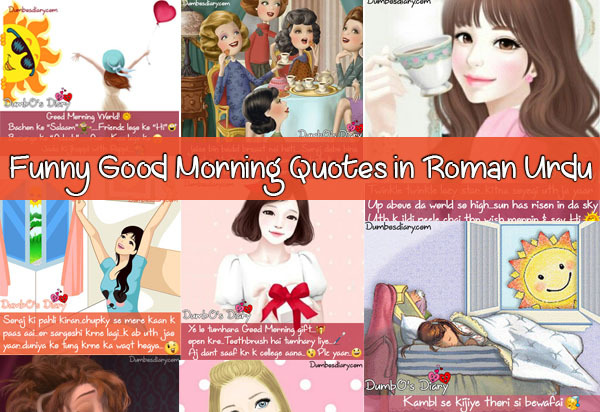 Here, I’m sharing a wonderful collection of funny good morning quotes in Roman Urdu with images. So, share these images to your beloved ones. You will feel special when you give a gift of smile to them. Download these images of funny quotes, share and bring smile on faces of your friends. Soraj ki pahli kiran, chupky se mere kaan k paas aai. Aur sargoshi kerne lagi. Keh ab uth bhi jao yaar, Duniya ko tung kerne ka waqat ho gya hai. Special cups of morning tea. Ik mere liye or dosra bhi mere he liye. Tumain chaiye to khud bana ke piyo. Hath tooty hain kya? “Thakkan-nagr” se “Fresh-pur” tak aany wali “Pyari Nindiya” samjhota xpress “Parbat-abad” pohnch chuki hai. Musafron se guzarish hai keh woh ab apny suhany sapno se bahir aa jyain..
Dil kerta hai tumain cream ki trah morning coffee pe daal k saray ka sara kha jaon.